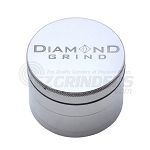 The Diamond Grind aluminum grinder is a premium 4 piece grinder with a very sturdy anodized aluminum build that makes it a very long lasting grinder. It comes with a stainless steel sifting screen, a magnetically sealed top to avoid spilling, a storage area on the bottom, a black velvet carrying pouch, and a triangle scraping tool to get any material off the edges that might stick. 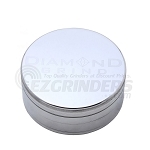 The medium size measures 56mm (about 2.25 inches) which isn't too big or too small so it's great for use at home or elsewhere.